Each of our men's leather wallets are crafted with a multiplicity of lifestyles in mind and, for those who prioritise organisation, our leather coin wallets are an exceptional choice. Crafted from Italian calf leather, each style is compact yet boasts an abundance of storage. A snap close coin pocket will keep change secure, while note pockets and card slots provide space for the rest of your essentials. Discover smooth finishes, luxurious textures and contemporary zip closures, and complement your choice with our men's credit card wallets. Our Coin Wallets are handmade in beautiful English Bridle and Croc Calf in stunning colours and feature three credit card pockets, two large full length, full depth pockets for ample storage for notes, two large multi-purpose pockets for credit or business cards and one handy coin compartment with a hidden snap fastener. 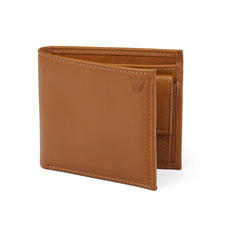 All of our Mens Leather Coin Wallets can be personalised with up to 4 initials.